Use the controls to pan or zoom the map. Use the controls to pan or zoom the map. Click each pie chart to reveal sampling data. Every year, millions of tons of sulfur dioxide and nitrogen oxides are emitted to the atmosphere as a result of the burning of fossil fuels and from other high temperature sources (see the Sulfur Dioxide Emissions indicator and the Nitrogen Oxides Emissions indicator). These gases react with water, oxygen, and oxidants to form acidic compounds, which may be carried hundreds of miles by the wind—even across state or national borders. Acid deposition occurs when these compounds fall to the Earth in one of two forms: wet (dissolved in rain, snow, and fog) or dry (solid and gaseous particles deposited on surfaces during periods of no precipitation). While wet deposition is the more widely recognized form (more commonly referred to as “acid rain”), dry deposition can account for a widely varying portion of total acid deposition, depending on location and climate (Exhibits 3 and 4). In the environment, acid deposition causes soils and water bodies to acidify, which can make the water unsuitable for some fish and other wildlife. Some types of ecosystems, those with less “buffering” capacity, are more sensitive to acid deposition than others. Scientists often use acid neutralizing capacity, a measure of the amount of anions, protons, and non-proton cations in the water, as an indicator of which lakes and streams are most sensitive to acidification (NAPAP, 2005). Most surface waters in the West do not exhibit many symptoms of acidification, because relatively small amounts of acid deposition occur in acid-sensitive regions. In the Northeast and along the Appalachian Mountains, however, relatively high levels of acid deposition occur in acid-sensitive regions, or regions without enough geochemical buffering capacity to prevent acidification of surface waters by acid deposition (see the Lake and Stream Acidity indicator). Therefore, reductions in acid deposition have the largest impact on acidification of lakes and streams in those areas. Acid deposition can have many harmful ecological effects in both land and water systems. While acid deposition can damage tree foliage directly, it more commonly stresses trees by changing the chemical and physical characteristics of the soil (U.S. EPA, 2003). The nitrogen portion of acid deposition contributes to eutrophication in coastal ecosystems, the symptoms of which include potentially toxic algal blooms, fish kills, and loss of plant and animal diversity. Acidification of lakes and streams can increase the amount of methylmercury available in aquatic systems (Winfrey and Rudd, 1990). Finally, increased levels of sulfate in ground-level air, a phenomenon related to dry deposition, can contribute to decreased visibility as well as a variety of human health problems (U.S. EPA, 2003). Total acid deposition in this indicator is determined using wet deposition measurements and dry deposition calculated from ambient air concentration measurements. Wet deposition is measured through chemical analysis of rainwater collected at sites across the U.S. 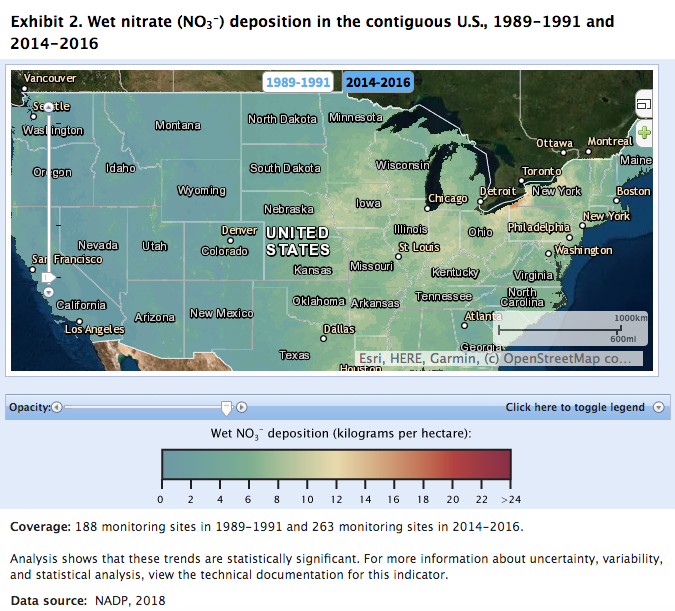 The primary source of wet deposition information comes from the National Atmospheric Deposition Program (NADP)/National Trends Network (NTN). The chemical components of wet deposition include sulfate, nitrate, and ammonium. Dry deposition is not measured directly. EPA’s Clean Air Status and Trends Network (CASTNET) determines dry deposition inferentially by measuring ambient air concentrations of acidic compounds and then calculating deposition rates using a multi-layer model that depends on meteorological data collected at the sites as well as local vegetative conditions (https://www.epa.gov/castnet). Chemicals measured include components of particulate matter (ammonium [NH4+], sulfate [SO42-], and nitrate [NO3-]), gaseous nitric acid (HNO3), and sulfur dioxide (SO2). This indicator uses the 3-year average from 1989-1991 as a baseline, as this period immediately predates controls on sulfur and nitrogen oxide emissions mandated by the 1990 Clean Air Act Amendments. Baseline data are compared to the most recent 3-year average data available (2011-2013). Use of 3-year average data helps ensure that trends reflect actual changes in acid deposition, instead of shorter-term fluctuations in meteorological conditions. Additionally, this indicator presents annual trend data for total deposition in the eastern U.S., which characterizes deposition over the entire period of record, not just for the baseline and most recent 3-year average periods. 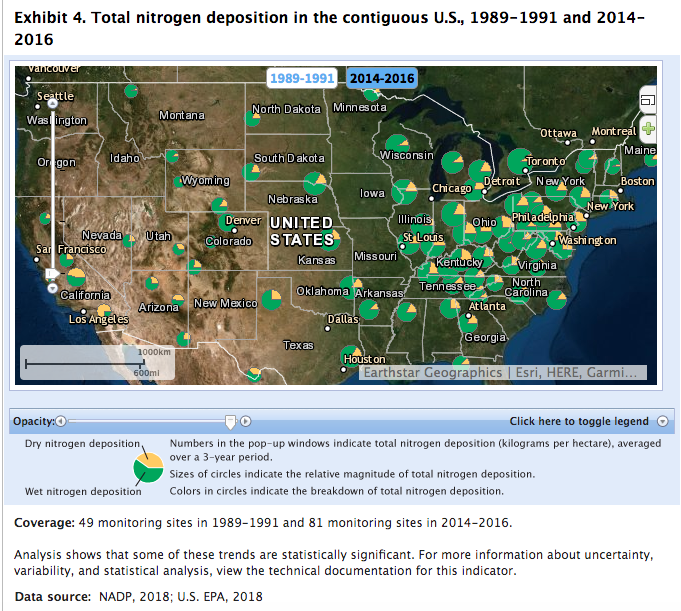 Analyses of long-term monitoring data from the National Atmospheric Deposition Program show that wet deposition of both sulfur and nitrogen compounds has decreased over the last 25 years (Exhibits 1 and 2). 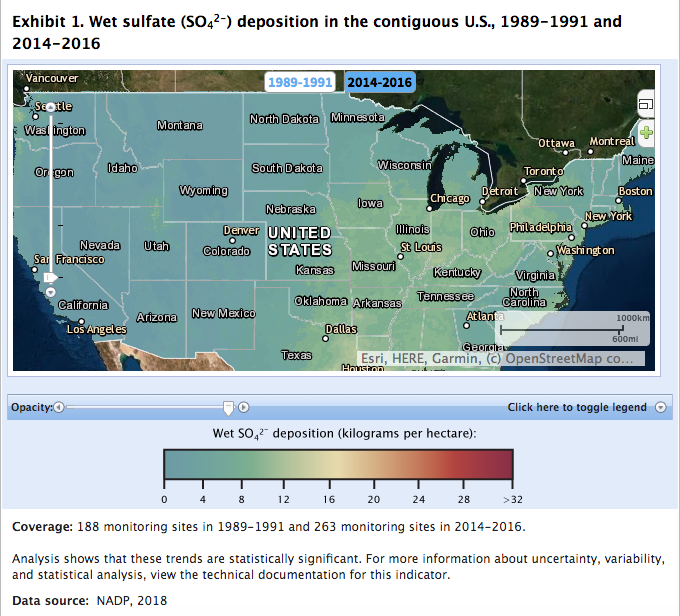 Wet sulfate deposition decreased across much of the U.S. since 1989 (Exhibit 1). The greatest reductions in wet sulfate deposition occurred in the Mid-Appalachian region (Maryland, New York, West Virginia, Virginia, and most of Pennsylvania) and the Ohio River Valley. Less dramatic reductions were observed across much of New England, portions of the Southern Appalachians, and some areas of the Midwest. Between the 1989 to 1991 and 2011 to 2013 observation periods, decreases in wet deposition of sulfate averaged more than 62 percent for the eastern United States. Reductions in nitrogen deposition recorded since the early 1990s have been less pronounced than those for sulfur. Wet nitrate deposition decreased approximately 45 percent across the Northeast and Mid-Atlantic between the periods 1989-1991 and 2009-2013 (Exhibit 2). However, there is a high degree of variability in the measurements used to calculate these percentages, complicating efforts to reliably estimate trends for wet nitrate deposition. As with wet deposition, total deposition (the sum of wet and dry deposition) decreased overall between 1989-1991 and 2011-2013, and reductions were more substantial for sulfur compounds than for nitrogen compounds (Exhibits 3 and 4). 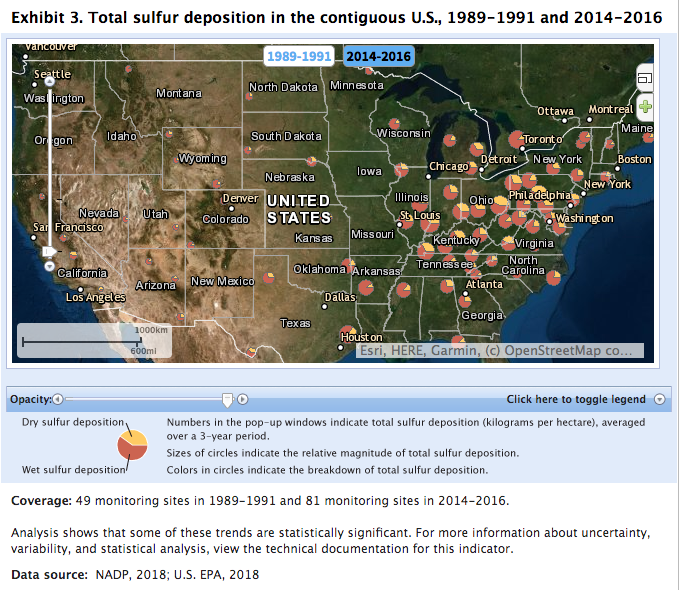 At 34 long-term monitoring sites in the eastern U.S., where data are most abundant, average total sulfur deposition decreased by 75 percent between 1989-1991 and 2011-2013 (Exhibit 5), while average total nitrogen deposition decreased by 39 percent over the same time frames (Exhibit 6). Geographic coverage is limited, particularly for dry deposition (and thus total deposition as well), but the concentration of sites in the Midwest and Northeast is justified by the fact that acid rain is much more of a problem in those regions than it is in the West, Great Plains, or Southeast. Measurement techniques for dry deposition have improved substantially, but characterization of dry deposition still requires a combination of measurements and modeling, which has inherent uncertainties. Further, dry deposition presented in this indicator does not include contributions from deposition of gaseous ammonia. Summary data in this indicator were provided by EPA’s Office of Atmospheric Programs, based on data from three sources. Wet deposition data are the product of concentrations measured by the National Atmospheric Deposition Program/National Trends Network (NADP, 2014) (http://nadp.sws.uiuc.edu) and precipitation amounts estimated from the PRISM model available through the PRISM Climate Group (http://www.prism.oregonstate.edu). Dry deposition data are from the Clean Air Status and Trends Network (U.S. EPA, 2014) (https://www.epa.gov/castnet). This indicator aggregates data across 3-year periods to avoid influences from short-term fluctuations in meteorological conditions, and wet deposition data were interpolated among monitoring stations to generate the maps shown in Exhibits 1 and 2. NADP (National Atmospheric Deposition Program). 2014. Data from the NADP/National Trends Network. Accessed 2014. http://nadp.sws.uiuc.edu. NAPAP (National Acid Precipitation Assessment Program). 2005. National Acid Precipitation Assessment Program report to Congress: an integrated assessment. Washington, DC: National Science and Technology Council. U.S. EPA (United States Environmental Protection Agency). 2014. Data from the Clean Air Status and Trends Network. Accessed 2014. https://www.epa.gov/castnet. U.S. EPA. 2010. Our nation's air: status and trends through 2008. EPA/454/R-09/002. Research Triangle Park, NC. https://nepis.epa.gov/Exe/ZyPDF.cgi/P1008KCP.PDF?Dockey=P1008KCP.pdf (PDF) (54 pp, 27.1MB). U.S. EPA. 2003. Latest findings on national air quality: 2002 status and trends. EPA/454/K-03/001. Research Triangle Park, NC. https://nepis.epa.gov/Exe/ZyPDF.cgi/P1003URM.PDF?Dockey=P1003URM.pdf (PDF) (36 pp, 4.4MB). Winfrey, M.R., and J.W.M. Rudd. 1990. Environmental factors affecting the formation of methyl mercury in low pH lakes. Environ. Toxicol. Chem. 9(7):853-869.